Seal Reinforced Fiberglass, Inc. is a well-established custom fiberglass manufacturer. 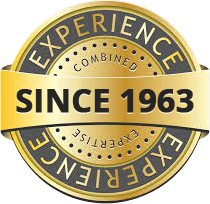 Founded in 1963 by Thomas Kaler, his experience in the custom FRP business dates back to the 1950s. His knowledge and experience have been passed onto his sons. They now have over 100 years combined experience in the field. Currently, Seal has a total of 30 employees including a family-run management team who work closely together. We have emerged as a leader in custom molding of every type. These types are hand lay-up, spray-up, vacuum bag molding, RTM and matched die molding. Our scope of knowledge ranges from military and architectural engineering specifications to commercial, automotive, marine, industrial and architectural components. Seal is a multifaceted organization accustomed to taking a job from the design stage to completion. We can do custom, one of a kind, long or short run production jobs. We have the ability to custom design any project that can be imagined. Our services include complete design and structural engineering, custom molding, tooling patterns, steel fabrication, prototypes, artistic set design and fabrication, marquees and display signs, architectural enhancement and restorations, artwork replication, sculpture and custom fountains. We utilize current AutoCAD, Rhino and Data CAD programs. We also have five- (5) axis routing capabilities and a 25,000 square foot factory that is fully owned by Seal Reinforced Fiberglass. Our talented craftsmen, skilled engineers and service staff work diligently to meet the expectations of all of our clients. This enables us to successfully complete numerous projects throughout Queens, the United States and even overseas. The ability to be flexible in what we can produce has always been our strongest asset. We can produce projects from existing prototypes, models or technical drawings. Projects can be from your own concepts. We will enhance, restore or modify existing products. Whether big or small, ornate or plain, curved or straight, there are no boundaries to our versatility. Extra fine fibers of glass are what composes fiberglass. The material is specifically termed FRP or fiber-reinforced polymers. Fiberglass had its initial fabrication in the mid-1930s. When the material is used to reinforce plastic, it can be used for a myriad of structures. Serving Brooklyn, Queens, Manhattan, New York City, Nassau and Suffolk.